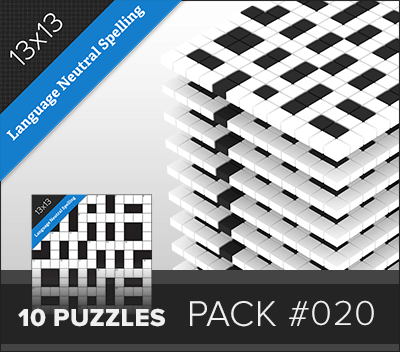 Pack of ten Language Neutral crosswords. This means that all words that are rendered differently in the US and British spelling systems have been removed and the clues use words and concepts common to both US and British English culture. Word break-ups are usually indicated in brackets for anything that isn’t a whole word. A clue for HOLDUP might be ‘Bottleneck (4-2)’ or ‘Rob (bank) (4,2)’. The British crossword grid style has fewer words, usually intersecting at every first, third, fifth etc. letter. 13x13 British style grid; synonym style clues; language-neutral puzzle for any English-speaker anywhere in the world. Pack of 10 crosswords: 13x13 British style grid, Language-neutral (can be used in both British English and US English spelling zones), synonym style clues.